GRC 20/20 recently announced SAP as the winner of the 2014 GRC Value Awards in the category of GRC Architecture and Integration. By implementing its solutions for governance, risk, and compliance (GRC), SAP SE has achieved a holistic regulation, business process, risk, and control overview based on a single, accurate, real-time data source. It is the world’s largest GRC implementation that SAP is aware of. The project accelerated many key GRC processes and is greatly assisting decision makers. 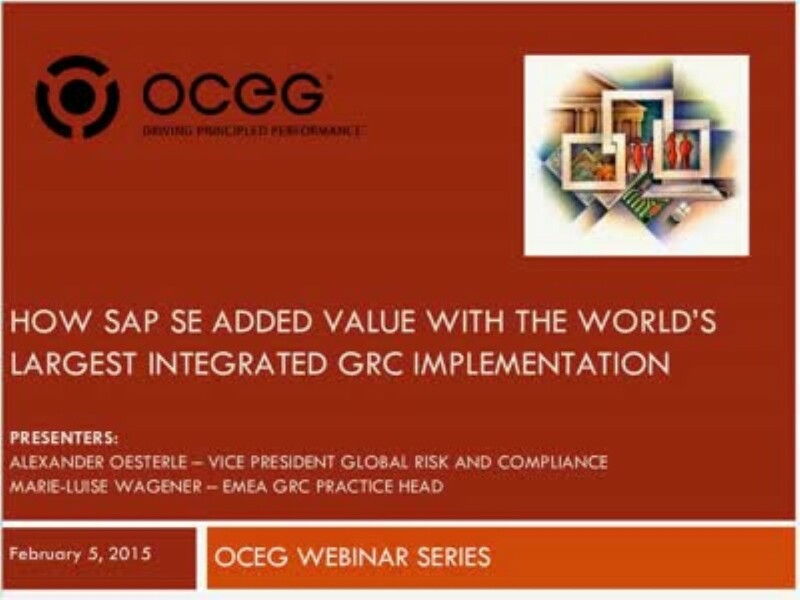 We have emailed instructions to access How SAP SE Added Value with the Worlds Largest Integrated GRC Implementation to . Make sure the email arrives in your inbox: either add "support@oceg.org" as a safe sender to your email platform, or if you use Gmail, drag our email into your Primary tab.